When the first structures were being built in Coney Island in the 1840s, the surrounding community was in uproar. Residents wanted to preserve the land’s natural beauty. In the early 1900s, the City of New York endeavored to condemn all buildings south of Surf Avenue and the amusement community of Coney Island opposed the city. Amusements on the beach were demolished under the direction of urban planner Robert Moses in the ’40s and ’50s. He cleared the land for the New York Aquarium, Abe Stark Ice Skating Rink and low-income housing. Once Moses was through with his Coney Island renovations, only a few areas remained protected for amusement use only and that small designation was a response to public complaints. Fred Trump attempted to build luxury apartments on the beach in 1964. He spent a decade in court fighting for a rezoning to no avail. By the 1970s, few visitors traveled to Coney Island and the city attempted to bring popularity back to the area with gambling casinos, taking note from Atlantic City. Gambling remained illegal in Coney Island, however, and vacant lots dominated areas that would have been lined with slot machines and card tables. Ravaged by Hurricane Sandy in October 2012, Coney Island’s future once again seemed to be in the fickle hands of fate. Coney Island was hit harder by the storm than many other areas of New York City. Salvaging what was left of the historic boardwalk and amusement area seemed nearly impossible in the wake of the treacherous storm. “Our park is devastated,” Deno Vouderis, a member of the family that owns the Deno’s Wonderwheel Amusement Park, told NPR’s Zoe Chace shortly after the hurricane hit. The motors in his haunted house were dead. Everything she saw during her tour of his property seemed flattened. But when she made the trek out to Coney Island again for the opening day of the Wonderwheel Amusement Park, she saw something she hadn’t expected to see again, particularly not so soon after the storm: functioning rides, doors open for business and rides welcoming the public. In a follow-up report on the destination, Chace worked to discover what revived Coney Island so quickly. Deno’s Wonderwheel Amusement Park didn’t have the kind of insurance that other structures throughout New York that quickly recovered and rebuilt did. While FEMA and other aid groups were doing their best to assist residents whose homes had been destroyed, Coney Island business owners followed an informal but traditional route and sourced the funds they needed to rebuild from family members, friends, patrons and other members of the community. The Vouderis family did this, as well. They also put a hefty amount of rebuilding charges on their credit card. I went to Coney Island twice in January. I dressed in my snow gear and walked along the boardwalk and the beach. Most things were still closed; even the waves seemed eerily silent then. I went back again a couple weeks ago to an entirely different scene. People were lined up at Nathan’s and weaving in and out of the businesses that were open. Although much of the boardwalk was still closed that afternoon, oxygenated blood was clearly pulsing through the community. But the future of Coney Island, keeping with tradition, still seems vague. An Applebee’s is opening in June not far from the beach. A chain candy store will soon be doing business near the adored Williams Candy shop. Coney Island has admirably handled the blows from the hurricane, but how the small businesses there will weather the storm of corporate expansion remains to be seen. While walking back to our car, a man beckoned my husband and me over toward him from behind his carnival game’s counter. The game seemed simple, though I knew the odds were against us. If my husband could just pay the couple bucks it took to play the game and then make every shot into the makeshift hoop, he could choose any prize he wanted, most of which were stuffed animals that looked like they’d been there for a while, and even get his money back. The catch? For every shot he missed, he had to lay down as much money as he’d already invested in the game. He made almost all of his shots, but the stakes began to raise and before we knew it, we were out of cash. “Got money in your bank? There’s an ATM right there,” the man said, pointing to the conveniently placed ATM. My husband could have continued playing and won back all of the cash he’d spent, but we left the $10 with the man working the game. The owner of that stand, like the owners of all other businesses that have reopened in Coney Island, only has his gate drawn up today because he knows the rules of the game: keep investing even when the odds seem against you and hope the cash doesn’t run out. UPDATE: Several commenters have noted that the roller coaster was removed this week as part of the ongoing clean-up of the Jersey shore. A photograph captures a moment in time, and while this scene may not exist anymore, it’s still a powerful document of history. Earlier this week, Secretary of the Interior Ken Salazar announced that the Statue of Liberty will reopen to visitors this summer just in time to celebrate America’s birthday. 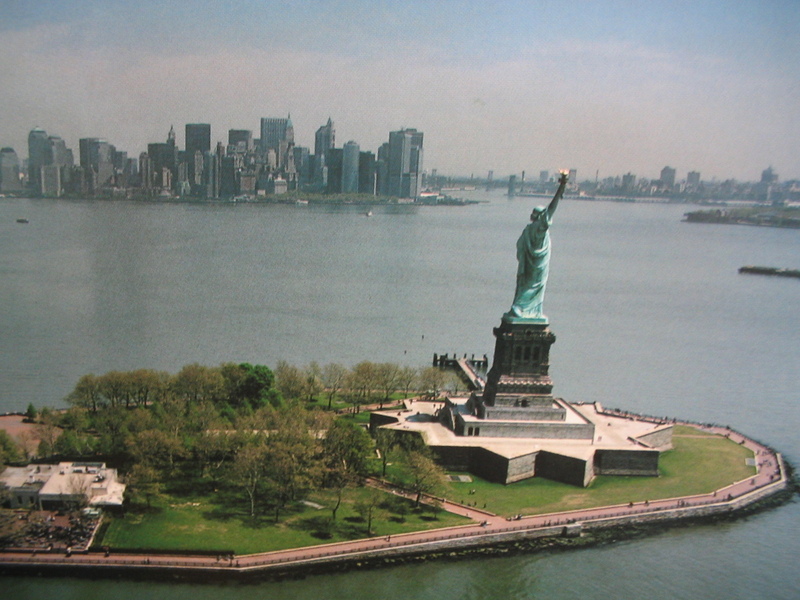 The iconic statue, and the island it sits on, suffered damage during Hurricane Sandy in October but is now on track to return to service by July 4, 2013. During the mega-storm that engulfed the East Coast last year, Liberty Island suffered considerable amounts of damage due to the high winds, excessive rain and flooding. Salazar indicated that Sandy managed to not only destroy the docks that grant access to the island, but also knocked out the security screening system and power grid as well. And while damage to the statue itself was minimal, railings and sidewalks crumbled, buildings were submerged under water and boilers were destroyed. Finding sources of funding to make the repairs has become a bit of a challenge, especially in the wake of sequestration budget cuts. But the Statue is one of the top tourist attractions in all of New York City, attracting 3.7 million visitors in 2011. That means it is a revenue generator that the local economy will be happy to have back in operation for the busy summer months. The exact date of the reopening hasn’t been determined yet, but Salazar said more information will be coming soon. He did want to stress, however, that Statue will be in tip-top shape in time for annual Independence Day celebrations. Nearby Ellis Island won’t quite be so lucky, however, as there has been no time table set for its reopening at this time. “Rockaway Beach, NY, Three Months After Sandy, GH2 &100-300mm” from David Whalen on Vimeo. I wanted to go to Rockaway Beach last week, but I went to Coney Island instead. I was just looking for a nice and cold walk on the beach with my dogs, but I wasn’t sure what sort of shape Rockaway was in since being devastated by Hurricane Sandy. While preparing to make another chilly run to the beach with my dogs today, I found this video taken less than two weeks ago of Rockaway Beach. The creator of the film, David Whalen of La Mancha Media documents the damage that still exists in Rockaway today. Rockaway is still visibly damaged from Sandy. Here’s to keeping the community of Rockaway in our thoughts as they continue to rebuild. For anyone who saw it, a dark version of Manhattan was, if nothing else, different. It was spooky for some and plain frightening for others, but no matter what, it was new. The darkness that blanketed the city during and after Hurricane Sandy dressed Lower Manhattan in a stillness not usually seen within the city. Thanks to Laughing Squid, I saw this video, which captures the experience of city blackness with excellent footage and narration. Titled “NYC Dark,” this collaboration between Jared Levy, Michael Marantz and Already Alive is a good one worth watching.